Action Comics #900 was out this week. I generally like to stay as positive as I can about the comics I buy, but this issue really, really bugged me. 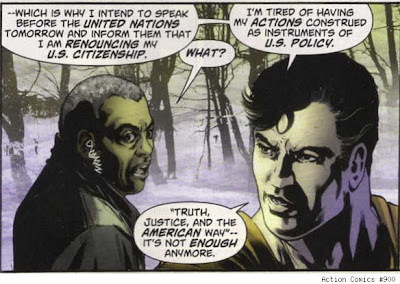 This is of course the issue where Superman decides to revoke his American citizenship, stating that "Truth, Justice and the American Way" isn't enough any more. As you can imagine, this story has caused quite a bit of controversy, but for me it's not the most controversial part of the issue. 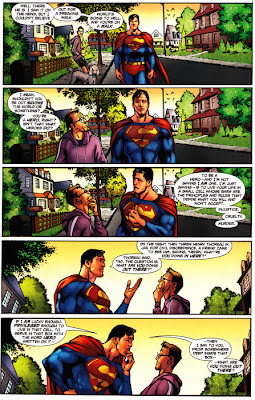 There was another part of the issue that annoyed me far more than an unpatriotic Superman. David S. Goyer's The Incident is an interesting story that's undermined by it's daft conclusion. The story depicts Superman flying to Iran to get involved in the riots in Tehran. While there he protects those behind the uprisings from the Iranian government’s army through an act of non-violent protest. He is then chastised by a US government official for causing an international incident for America. This then leads to Superman's decision to renounce his citizenship. The U.S government guy quite rightly points out that Superman presence didn't make a blind bit of difference to the people of Iran. Superman concedes that on a "macro scale" he didn't seem to have been much help, but he had witnessed a protester giving a soldier a rose, which the soldier accepted. 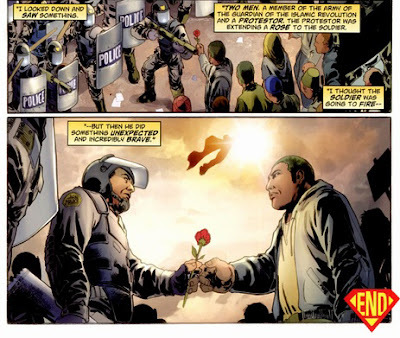 Rather than a touching scene demonstrating Superman's ability to inspire people, this seemed to me more like something you might see in a cheesy, cliché ridden film about civil unrest and hippie culture in '60s America. As for Superman renouncing his citizenship, I don't think it's really that big a deal. This was a one off back up strip that will probably never be mentioned again, and it seemed like a story Goyer wanted to tell rather than something that's come from the top. At the same time, I do wonder if this story really needed to be told. I felt the same as I did when Frank Langella's Perry White asked if Superman was still fighting for "Truth, Justice..all that stuff" in Superman Returns. Why be embarrassed of the "American Way"? People are intelligent enough to separate the ideals on which a country is founded from the actions of any particular government. Also, Superman is famously an American icon, us non-Americans won't get offended if he occasionally mentions that he quite likes the country in which he was raised. This story however, wasn't my major problem with Action Comics #900. I've just sent DC Comics an email regarding the issue, particularly the conclusion to Paul Cornell's Lex Luthor tale, The Black Ring. I present to you now a copy of the email, so that you all may witness my impotent fanboy rage! I must confess I'm absolutely baffled as to your thinking regarding Action Comics #900 and the finale to The Black Ring. The Black Ring has been such a fantastic story, and until #900 it was shaping up to be the ultimate Lex Luthor story. Paul Cornell was able to give us such a clear picture of Luthor's motives and personality that I really found myself rooting for Lex. Not only that but the story was fun too! Mr Mind vs. Cowboy Lex! Gorilla Grodd with a giant spoon! Gun-toting, robot Lois! The Black Ring was a hoot! And then you guys made the utterly bizarre decision to tie the finale into a Doomsday story that hasn't even finished yet! This is the grand finale of the best Lex Luthor story ever and it's clumped together with the midway point of a mediocre Doomsday story! Why?! It completely robbed the finale of its momentum and power. Lex Luthor has the power of a god, he's got Superman in his clutches and we have to keep switching back to Steel, Eradicator and the rest running through some corridors! Sorry to be so negative but it just seems to me that you've shot yourself in the foot here. You had the final part of an epic story that could have gone down in history as one of the greats and you deliberately sabotaged it by crowbarring in a completely unrelated story. 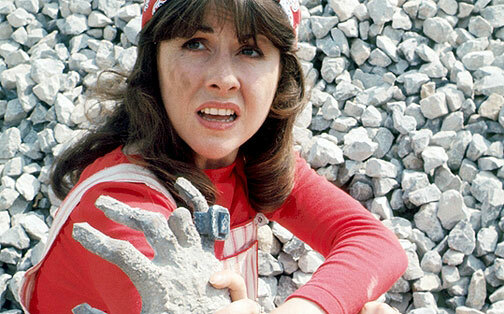 I've just heard the terribly sad news about the death of Elisabeth Sladen. She played the definitive Doctor Who companion, Sarah Jane Smith both in classic and new Doctor Who and in her own spin-off, The Sarah Jane Adventures. Usually when a famous person whom I admire passes away I do what, I think it's fair to say, a lot of people do in these situations. I spend a minute reflecting on what a shame it all is before updating my Facebook status with an RIP (mostly to demonstrate to my cultural awareness to my followers) and then indulging in some tasteless gallows humour in order to prevent myself from dwelling on my own mortality. Last year J. Michael Straczynski began his controversial Grounded storyline in the pages of Superman. I say controversial, what I really mean is that no bugger liked it! JMS left halfway through the story and the unenviable task of completing the story was given to iZombie writer Chris Roberson. And he's doing a bloody great job! To be fair I don't think JMS' issues are as bad as they've been made out to be. 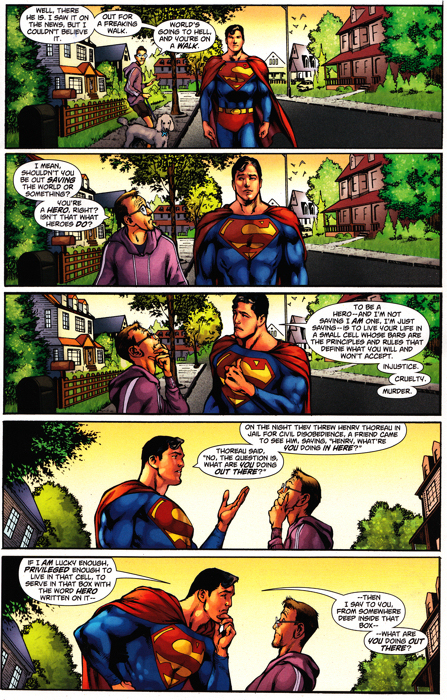 There were some cool moments and I still believe JMS' initial idea of Superman walking across the U.S.A to reconnect with humanity was an interesting one. However ultimately his issues had a self righteous and didactic tone that seemed to alienate just about everyone who read them. Chris Roberson's issues on the other hand couldn't be more different. Roberson is sticking only very loosely to JMS' original concept. Superman is still walking across America, however rather than have him reconnect with ordinary people, Roberson is taking this opportunity to reconnect Superman with his super-hero buddies. The result has been a bunch of issues that are low on big action and plot advancement but full of some wonderful character interaction and a lot of fun. Just like JMS, Roberson has continued to show Superman behaving out of character. 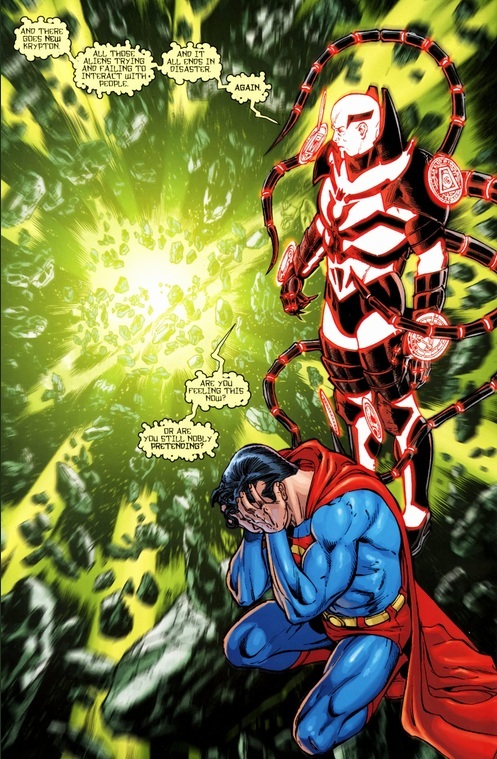 For example in #707, Roberson's first issue, Superman forbids Lois from exposing a polluting power plant in order to ensure the financial stability of a small community. Under JMS' pen, Superman's weird behaviour seemed to be the result of a writer bludgeoning the reader over the head with preachiness. Under Roberson however we've had quite a few hints as to the reasons for Superman's behaviour, with the possibilities ranging from magical influence to simply the trauma of having recently witnessed the destruction of New Krypton. But that's not the fun part. Roberson has also had Superman meet up with the new Wonder Woman, the Flash and Batman, and each of these heroes have consoled Superman in their own unique and touching manner. Wonder Woman reminded Superman what an inspiration he is to other heroes while Flash helped Superman move towards regaining some of his moral certainty. 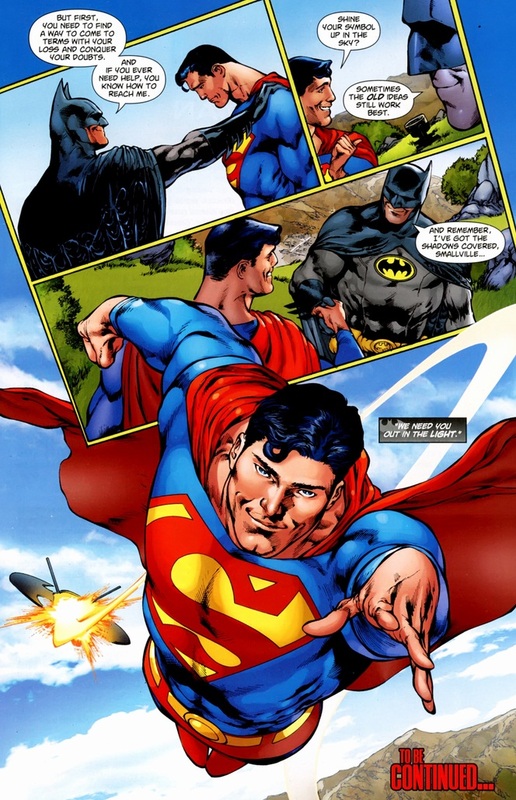 Batman helped Superman to acknowledge that he's grieving and offered him a helping hand during this difficult time. As Superman has been reminded who he is and what he means to the world, so have we. Judging by the warmth that comes from these lovely character moments I wouldn't be surprised if Roberson is enjoying the opportunity to explore these characters and their connection to Superman. He also seems to be enjoying the opportunity to reference old plot points, characters and story lines. In the past four issues we've had references to stories as diverse as Grant Morrison's DC: One Million and Chuck Dixon's Superman: The Odyssey. We've also seen references to Iron Munro, a character from Young All-Stars who, like Superman owes much of his existence to Phillip Wylie's 1930 novel Gladiator. We've had a cameo from a brand new Super-Chief and even seen Lex Luthor's "terrible" theft of forty cakes from DC's 1978 Super-Dictionary made canon! It's certainly possible to argue that all these references are self indulgent, but I would argue that it's possible to justify every single one of them as part of the process of reminding Superman, and us, of what he stands for. 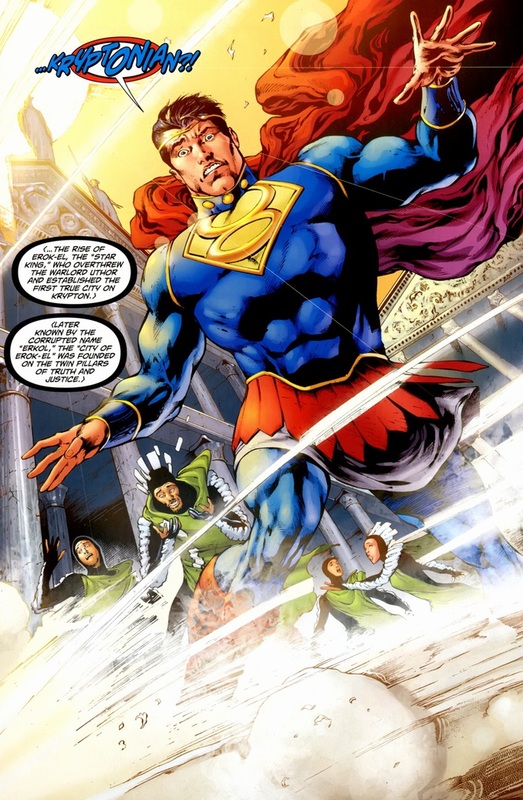 For example, the appearance of Grant Morrison's Super-Squad is not just a tip of the hat to DC: One Million, but also serves as a demonstration to a Superman plagued with doubt of his importance and potential. 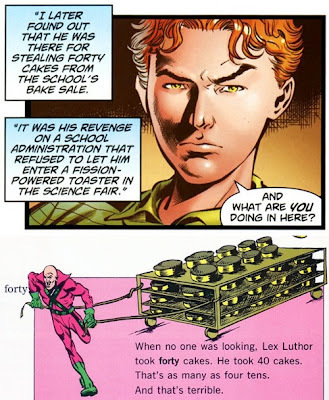 Luthor stealing cakes in Superman #709 and the Super-Dictionary. These references also serve to demonstrate how much fun Roberson is having playing in the Super-toybox and how much love he clearly has for Superman comics. And this, I think is the key difference between his approach and the approach of JMS. JMS is obviously a man who is very passionate about Superman as an icon and an ideal and an inspiration. Check out this article by him to see what I mean. But Roberson has demonstrated with only four issues that he doesn't just love the idea of Superman, he loves the comics. He loves the whole package, not just the icon but the continuity, the quirkiness, the contradictions and the characters from over seventy years of stories. His fanboy love is dripping off every page and it's presented in such a joyful, celebratory, unapologetic manner that it's impossible to view it as self-indulgent, and very easy to get swept up in it. Just check out #709 for a perfect example of what I mean. Flash has a Kryptonian headband stuck on his head that's driving him insane with it's constant barrage of Kryptonian history. Flash manages to attract Superman's attention and gain his help by dressing everyone up, including Superman, in ancient Kryptonian clothes at super-speed. It's the kind of goofy yet fun scenario you might expect from an old issue of DC Comics Presents or even a really old 1960s issue of Superman. And yet Roberson uses this slightly absurd scenario as a springboard for a touching heart to heart between Flash and Superman on the subject of morality. JMS set out to bring Superman back to his roots by reconnecting him with the people of America. In this sense Roberson's run has so far been a failure. Since Roberson began his run the people of America have barely featured at all. However Roberson has succeeded in so many other ways. He's reconnected Superman with his fellow heroes but most importantly he's reconnected Superman with the reader by tearing down the barrier of smug didactism erected by JMS and making Superman fun again! I can only hope that Roberson is allowed to stay on the title and we get a chance to see what happens when neither Superman or Roberson are Grounded and both can demonstrate their full potential.